Methuen/Tewksbury goalie Kala Hollingsworth makes a kick save on Austin Prep&apos;s Samantha Taber on a breakaway in overtime. With the Division 1 title on the line Sunday afternoon, Methuen/Tewksbury junior Kaia Hollingsworth was at her best. 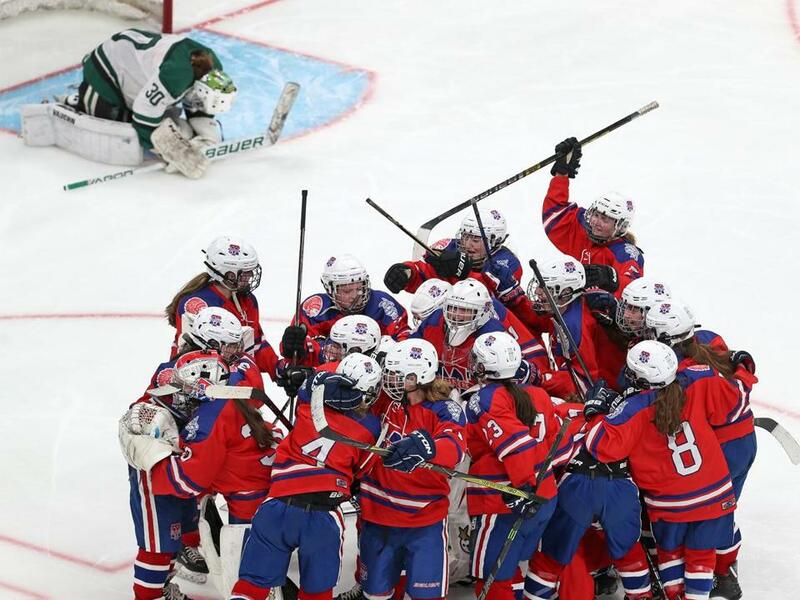 Hollingsworth made 35 saves, including a trio of spectacular stops in the first 12-minute overtime to secure the program’s first Division 1 state title, 3-2, in double OT, over Austin Prep at TD Garden. 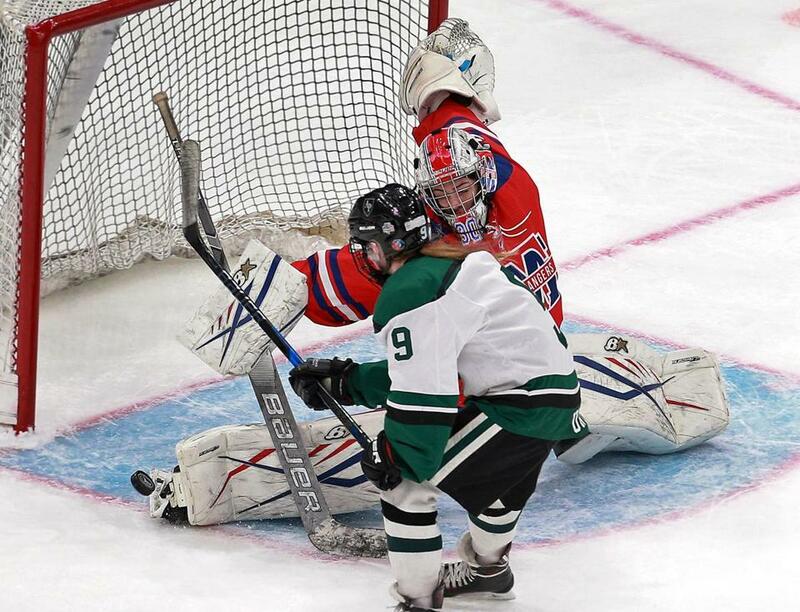 It was her stop with less than two minutes left in the frame against Austin Prep’s top scorer, eighth-grader Sam Taber, that really saved the game. Floating at center ice, Taber received a pass and darted toward the net at full speed. Taber dangled twice, then quickly went forehand to backhand. But Hollingsworth played it aggressively, turning aside the effort with her right pad to keep the game going. Hollingsworth made two more saves in the first overtime. With seven minutes to play in the period, Austin Prep senior Maeve Crehan took a partial breakaway down the left wing, flicking a shot that Hollingsworth snared with her outstretched glove. Moments later, she robbed freshman Aylah Cioffi of a similar goal on the back hand. With Hollingsworth strong on one end, the Red Rangers offense powered past a strong Cougars’ defense, feeding off the momentum from their goalie. Methuen/Tewksbury players celebrate after their victory over Austin Prep.